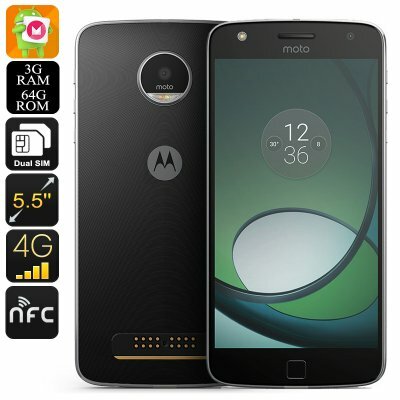 Successfully Added Lenovo Motorola Moto Z Play XT1635 Smartphone - Octa-Core CPU, 3GB RAM, 2TB External Memory, Dual-IMEI, Android 6.0, 4G (Black) to your Shopping Cart. The Motorola Moto Z Play XT1635 smartphone is one of the latest Android phones from China that has been released in September 2016. Packing sophisticated hardware and running on an Android 6.0 Operating System, this Chinese smartphone brings along a smooth and powerful performance that is guaranteed to deliver a satisfying user experience. Its sleek design and stunning 5.5-Inch display give this Android smartphone a high-end flagship look that is sure to turn some heads. Available now at Chinavasion at a remarkably low price, the Motorola Moto Z Play XT1635 truly is a smartphone to consider when searching for your next Android device. Supporting Dual-SIM and two IMEI numbers, this Android phone allows you to be reachable on two different phone numbers simultaneously. Perfect for separating work and private life or to stay connected and pay local prices while staying abroad for a longer period of time – this Dual-SIM smartphone is the perfect cell phone for everybody who lives a busy life. Further enhancing your connectivity are the phone’s 4G network capabilities – allowing you to browse the web and enjoy the fastest mobile data speeds out there no matter where you’re located. Engage in online calls, browse the web, stream movies, or play multiplayer games – with 4G connectivity you’ll always have the means necessary to stay connected to the web and enjoy all it has to offer at lightning speeds. Although the Motorola Moto Z Play XT1635 features an extremely sleek design it does hold some serious hardware from within. Packing a powerful Octa-Core CPU that has been clocked at 2.0GHz; his Android smartphone is capable of dealing with the most demanding of games and applications without dropping a frame. Additionally, 3GB of RAM increase the phone’s capabilities even further – letting you engage in the most intensive of multitasking sessions imaginable without you ever needing to worry about slowing down your device. Play games, watch movies, and use demanding applications all at the same time – the Motorola Moto Z Play XT1635 is guaranteed to handle whatever you throw at it. With 64GB of internal storage and the possibility to throw in an additional mind blowing 2TB of external memory, this Android phone offers oceans worth of space for you to save and store all your media and files alike. The phone’s 5.5-Inch super AMOLED display lets you enjoy all your phone’s features in absolutely breathtaking resolution. Supporting 1080p, you will be able to watch movies and play games in stunning detail and vivid color – providing you with a truly cinematic experience from the palm of your hand. Additionally, this beautiful display allows you to watch back all the pictures you took with the Motorola Moto Z Play XT1635 Android phone in their fullest glory. Featuring a professional-grade 16MP rear camera, this Chinese smartphone allows you to snap pictures and shoot video like no other. From now on you can be assured that not a single special moment in life passes by uncaptured as, with this camera in your pocket, you’ll always be able to snap the most beautiful images that allow you to recall all your memories later on. The Motorola Moto Z Play XT1635 smartphone comes with a 12 months warranty, brought to you by the leader in electronic devices as well as wholesale electronic gadgets..
Arabic: - الروبوت الذكي 6.0 - Chinese Simplified: - 6.0 的 android 智能手机 - Czech: - Smartphone se systémem Android 6.0 - Dutch: - Android 6.0-Smartphone - French: - Android Smartphone 6.0 - German: - Android 6.0 Smartphone - Hebrew: - הטלפון החכם אנדרואיד 6.0 - Hindi: - एंड्रॉयड 6.0 स्मार्टफोन - Hungarian: - Android 6.0 okostelefon - Italian: - Smartphone Android 6.0 - Japanese: - 6.0 の android スマート フォン - Korean: - 안 드 로이드 6.0 스마트폰 - Malay: - 6.0 pintar telefon Android - Norwegian Bokmål: - Android 6.0 Smartphone - Romanian: - Android 6.0 Smartphone - Russian: - Смартфон Android 6.0 - Spanish: - Android Smartphone 6.0 - Thai: - สมาร์ทโฟน android 6.0 - Turkish: - 6.0 Smartphone Android - Vietnamese: - Điện thoại thông minh Android 6.0.